Who Has Prospered Under President Obama? Investor’s Business Daily posted an article on Friday about the growth of regulations under the Obama Administration. 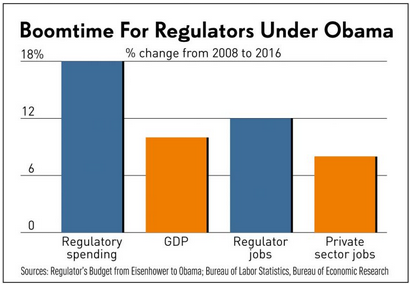 The growth of regulations under President Obama has been astounding. Total spending on federal regulatory activity has jumped almost 18% in real terms since Obama took office, reaching $56 billion this year. That outpaced overall economic growth, which has climbed a total of 13% since 2008. Over those same years, the number of jobs at these regulatory agencies climbed by 11.8% — to almost 280,000 workers — while the number of private sector jobs has growth by 8.5%. To put these numbers in perspective: If GDP had grown as fast as the federal regulatory budget, the economy would be $696 billion bigger today. If private sector employment had kept pace with the growth in regulatory jobs, there would be 3.7 million more people at work. The study, published jointly by the Weidenbaum Center at Washington University in St. Louis and the Regulatory Studies Center at George Washington University, also breaks down regulatory spending into “social” and “economic” categories. Social regulations cover health, safety and environment, and include agencies such as the FDA, Homeland Security, the EPA, the National Highway Traffic Safety Administration. The thing to remember here is that regulations cost money. They are an extra burden on small businesses and slow down the growth of the economy. Based on the administration’s own figures, these Obama-imposed rules cost the economy a total of $108 billion a year, but as Heritage notes, the actual costs are much higher because federal regulators routinely lowball compliance costs.